I look skeptically at my Nevada/Utah road map. I typically take the well populated I-15 when traipsing back and forth between Las Vegas and Seattle. But this time Highway 93 seems to be throbbing on my map. Not only is 93 a straight shot through Nevada, but veering slightly west would take me to Rachel, Nevada – the closest town to Area 51. A few hours later I can take highway 50 east to Great Basin National Park. Very tempting, especially when considering never ending road construction around Salt Lake City. I ponder the fact that I don’t know how to change a tire or deal with squeaky breaks (and I should, as evidenced here and here) and decide to take the road less traveled anyway. After one last round of video blackjack, I head north out of Vegas on 1-15 and take US 93 deeper into the desert. 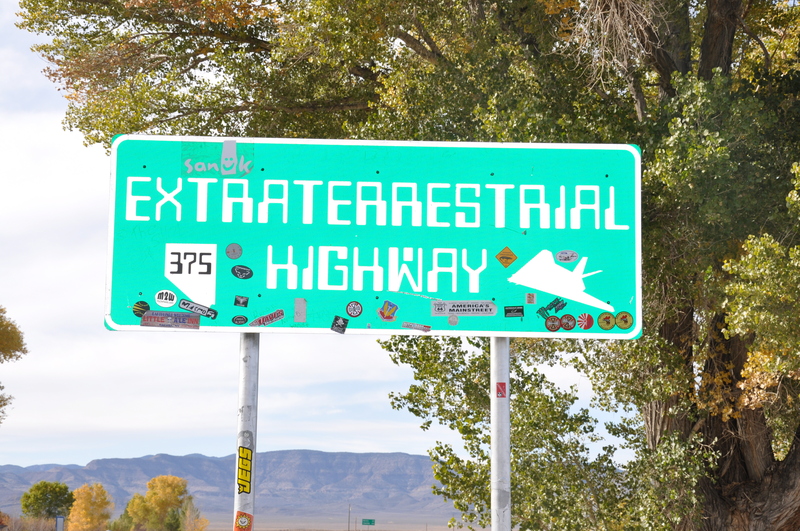 After 85 miles, I add my AAA bumper sticker to the famed Extraterrestrial Highway sign and head another 40 miles down the road, stopping for cows that amble freely across the road. I pull into the first and possibly only commercial establishment in Rachel, Nevada (Human Population: 98). You can’t miss the Little A’Le’Inn Restaurant, with its UFO crane in the front and trailers that double as motel lodging in the back. I grab an A’Le’Inn burger with extra ‘secretions’ and take a quick glance around town to make sure I haven’t missed any alien sightings. Then I re-trace my steps and head north on Highway 93 again. Two and a half hours later I cut east on Highway 50, officially titled The Loneliest Highway in America. It isn’t nearly as lonely as I’d worried about. The two lane highway is well maintained and the straight lanes between buttes and mesas make it easy to pass trucks. There are some stretches where my vehicle is the only one in sight, but there is enough traffic so I didn’t feel as if I’m alone on Mars. I follow the signs to Baker and Great Basin National Park and pull into the visitor’s center, wondering if I’m really here. I haven’t come across a National Parks pay station in the middle of the road yet. But I had indeed arrived. The bored looking ranger informs me that this National Park is free. Well, free except for camping fees ($12) or the charge for a guided tour into the Lehman Caves ($10). I grab an ice cream cone from the café, meander through the guided nature walk behind the ranger station and head up the mountain to find a place to camp. The ranger had suggested that I bypass the Lower Lehman Creek site, as it’s mostly an RV hangout. 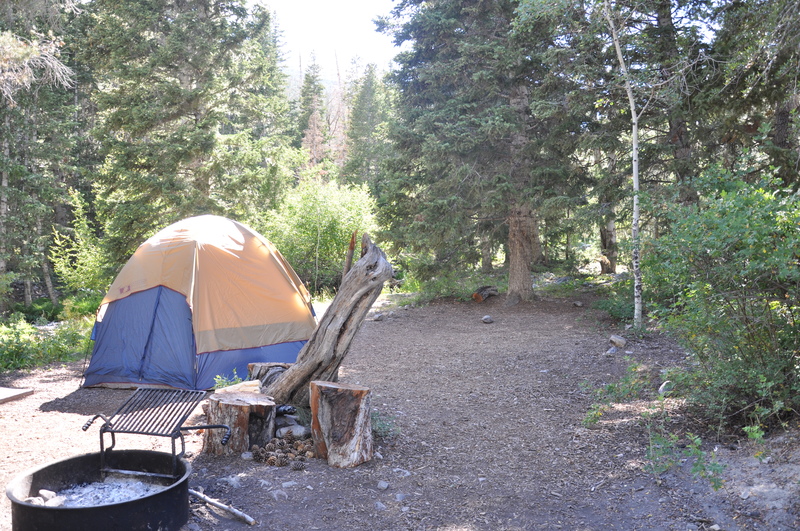 The Wheeler Peak campground apparently has the best sites, but requires a bumpy drive up the mountain. Since it’s getting dark and I’m afraid of mountain lions and wrecking my car, I leave Wheeler Peak alone. That leaves me pitching my tent at Upper Lehman Creek. The site is fine: quiet, next to a stream, and near a hiking trail (the seven mile Lehman Creek trail). The 24 site campground has three pit toilets. Pay showers were available in the nearby city of Baker. Or I could take a really cold bath in the creek for free. I don’t do either of those things. Instead, I assemble my pop up tent and fall asleep before I can worry about mountain lions or wild turkeys tearing my tent to shreds and having me for a midnight snack. I wake up at sunrise and snap pictures of Wheeler Peak. Great Basin National Park is where you can summit the 2nd highest peak in Nevada. I don’t though, as I’m way too busy fighting with my shelter. The tent, which had popped up so amiably the night before, is refusing to snap apart. After pulling on the poles, acquiring two blisters on my hands, eyeballing my car to see if I could get a mostly un-assembled tent in there (that would be a no), and exhausting my repertoire of swear words in English and Norwegian, I swallow my pride and ask the guys at a nearby camp site for help. For all you people making fun of me, know this: The guys couldn’t get the damn tent apart either. I end up snapping a pole in half just to get the contraption in my car. Beyond frustrated, I give Great Basin a curt goodbye and head towards Boise where there would be hotel rooms, showers, and nothing that I would have to disassemble. Highway 93: Fail. But I calm down as I get back onto the lonely road. Sure, my tent is a little broken, but my tires, brakes, and self are still in tact. I hadn’t been eaten by a mountain lion, abducted by aliens, or stranded on a lonely road. Highway 93: Success.